Onam, being the biggest festival of malayalis is considered to be good time for the home appliance industry. As the festive season started, most of the consumer electronics brands have started giving out the best offers to reap most out of Onam. Most of the top brands have started unveiling its products and also brought in the needed goods to meet the demands in the festive season. Along with major electronics brands like Sony, LG Electronics, Havells, Preethi Appliances and Panasonic, most popular brand Samsung has come up with special offers. Samsung which has made its presence in the global arena is gearing up to win the hearts of the Keralaties during this Onam. 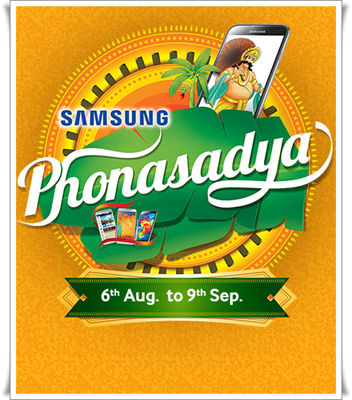 Titled 'Onam Phone Sadya', the company offers cool prizes including Trip to Dubai, Galaxy Phones and many other interesting rewards. After purchasing a Samsung smart phone, the customers should ask for the scratch card from the dealer. SMS Onam to 54242 from your purchased smart phone or tablet. The offer is valid from 6th August – 9th September 2014. Indian Residents 18 years or above can participate in the exclusive content. For the purchase of a Samsung smart phone one scratch card can be availed from the dealer. For the purchase of Rs.40,000 models price category, 4 scratch cards will be given. The smart code will be selected for the daily, weekly and bumper draw. The prize structure of the lucky draws is as follows. •	Smart LED TV 32"
All Smart Codes received during the week period shall be eligible for the weekly draws and the selected people shall be eligible for Dubai Trip (Couple – 2 Nights and 3 days). As mega bumper prize one winner will be eligible to win Kawasaki Ninja 650cc Bike. The results of the daily draw will be published in the official weblink www.samsung.com/in/phonasadhya. To track their status, participants need to visit the website and enter their Smart Code. Winners would be notified via SMS on their numbers. The winners need to send a copy of PAN Card (Self attested), Photo ID Proof and other required documents to get the prizes.